Microsoft Dynamics 365 for Sales Gets Even Better with Built-In AI: What’s coming in October 2018? It’s true. Artificial Intelligence (AI) is changing the world, making us and many of the apps we use on a daily basis smarter. Microsoft, always on the forefront of technological change, has embedded AI into its ERP and CRM solutions for years. This is especially the case for Microsoft Dynamics 365 which was launched in 2016, well after the AI revolution. 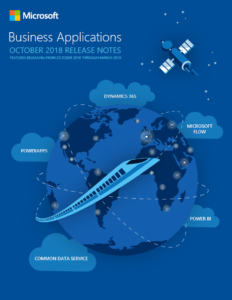 Now, with Microsoft’s publication of the Business Applications Release Notes for October 20181, we learn that the Dynamics 365 AI for Sales app is targeted for a public preview release in October, a mere 2 months away. At a high level, AI for Sales will enhance sales performance and planning capabilities. NOTE: To save yourself a lot of time, from the Table of Contents you can click directly to the section of the Release Notes that describes all of the enhancements to Dynamics 365 for Sales, which are featured on pages 27-33 of this 238-page document. If you want to sift through the entire document, we’re happy to offer you that experience. The AI for Sales app takes the hassle out of sales performance analysis by proactively and prescriptively providing useful insights from sales data. The app helps sales managers evaluate and improve the performance of their sales teams on Dynamics 365 and other sales applications. With churn measurement and pipeline forecasting using relationship health scores, sales leaders can better optimize their sales strategies. A home page that provides managers with answers to the most common questions regarding their team’s performance, and also provides useful insights to quickly allow them to focus on the right deals and activities. A natural language processing-based Q&A that allows managers to conversationally ask questions and receive reports from the sales data. Lead prioritization leveraging predictive lead scoring. Opportunity pipeline analysis using the relationship health score powered by exchange data. Sales team performance analysis and individual scorecards. Dynamics 365 applications powered by LinkedIn insights are taken to the next level by combining the modular and customizable LinkedIn Sales Navigator controls with the power and flexibility of Dynamics 365 Business Process Flows. Dynamics 365 for Sales is introducing Playbooks, a new capability to help organizations automate repeatable sales activities and respond to external events. Dynamics 365 Predictive Lead Scoring is a machine learning model-based predictive scoring mechanism that scores leads on a scale of 1 to 100 based on their likelihood to become an opportunity. The bullets above are just synopses and there’s so much more. Bond Consulting Services is a national consulting firm that empowers organizations across the United States to thrive in a digitally transformed world. We operate out of Long Beach, California, where our expert team assists clients with their ERP and CRM needs. This document is provided “as-is.” Information and views expressed in this document, including URL and other Internet Web site references, may change without notice. You bear the risk of using it. Some examples are for illustration only and are fictitious. No real association is intended or inferred.